‹The rest› 2013-2019, ca 20x20x20 cm, leftovers thread glued together. 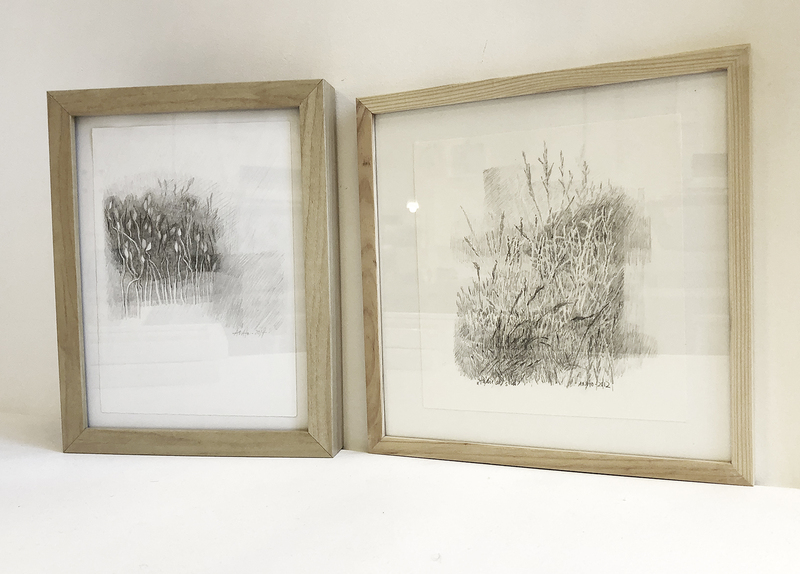 Exhibition period 17 February – 14 April 2019. 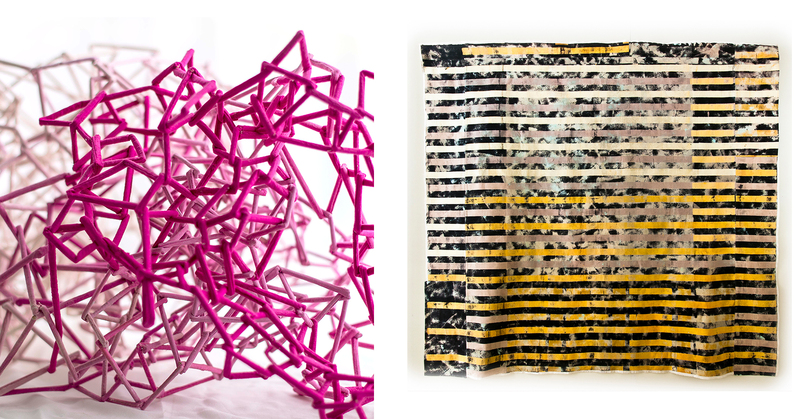 Silje Heggren, painting // Torunn Halseid Marø, textile // Audgunn Naustdal Holsen, textile. 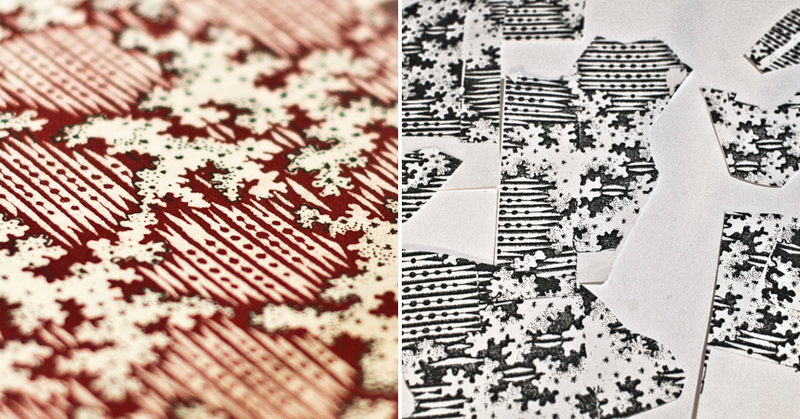 ‹Thread III› a,b og c, textileprint, ca 36×36 cm i ramme 42×42 cm, pigment printing on cotton satin. Sunnfjord Art Assosiation invites all members of the association to exhibit once a year. This year the exhibition was held from 24 November to 2 December in the exhibition hall, Førdehuset. 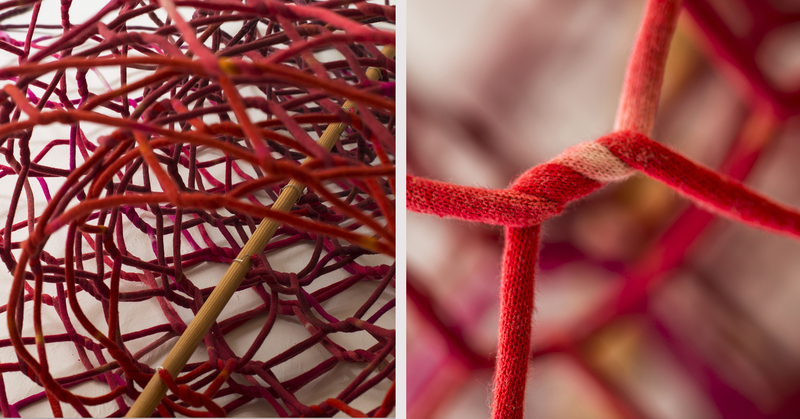 ‹Red fence›, 2018, detail, about 85x70x60 cm (unrolled length about 6 m), textile material embedded string, fence bonding technique. Art Exhibition of organized Kunstnarar with ties to Sogn og Fjordane. Free submission for all professional artists in the county. Opening by author Sivert Nesbø. Musical performances by Kaare Sandvik. 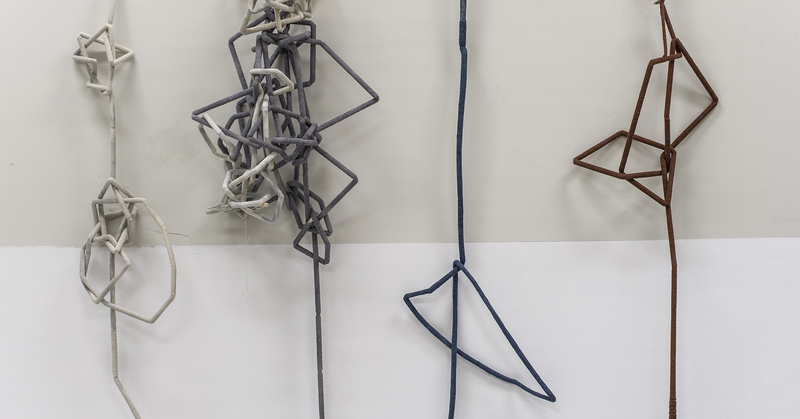 Sunnfjord Kunstlag organizes a larger group exhibition of professional artists. All participating artists have started their artist career at Heimyrkeskulen in Jølster. The school was located at Vassenden in Jølster, but no moved to Førde and Nordfjordeid and the school facility in Vassenden has been closed. 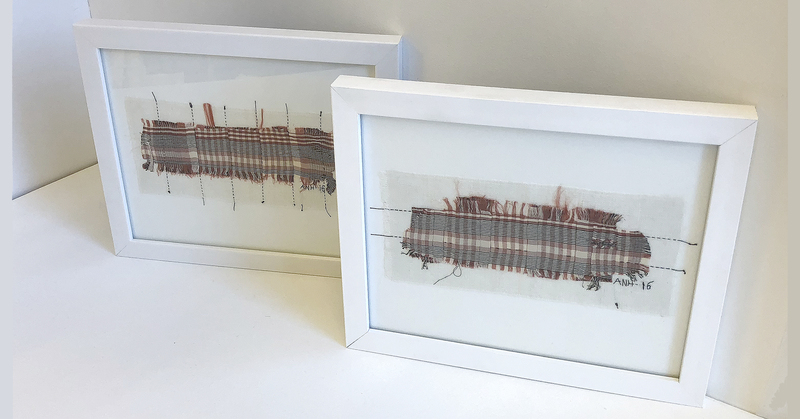 Textile Image, 2017, 8,5 x 8,5 cm mounted on 12 x 12 cm cards, linen fabric, textile printing, embroidery, cotton yarn. 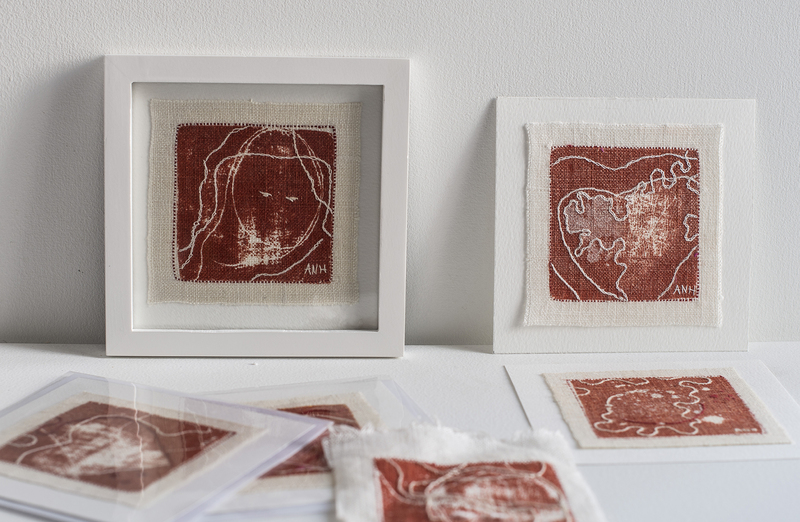 In the art shop at Sogn og Fjordane Art Museum I have delivered new textile cards. The cards in 2017 are red. Some left from last year is blue. Art shop is well worth a visit. Large selection of crafts- and fine art by local artists. I also sell other works in the shop. ‹Fabric› 1 og 2, 2017, 21×11 cm, fabric leftovers,seam, monted in frame. Sunnfjord Art assosiation annual membership exhibition in Førdehuset from Thursday 30 November to 10 December 2017. This is the one time a year all members of the art association are invited to exhibit and show their work. Here you will meet both amateurs and the professional artist in the art association. The exhibition is open weekdays18:00 – 20:00, Saturdays 14:00 – 16:00, Sundays 16.00 – 20.00. 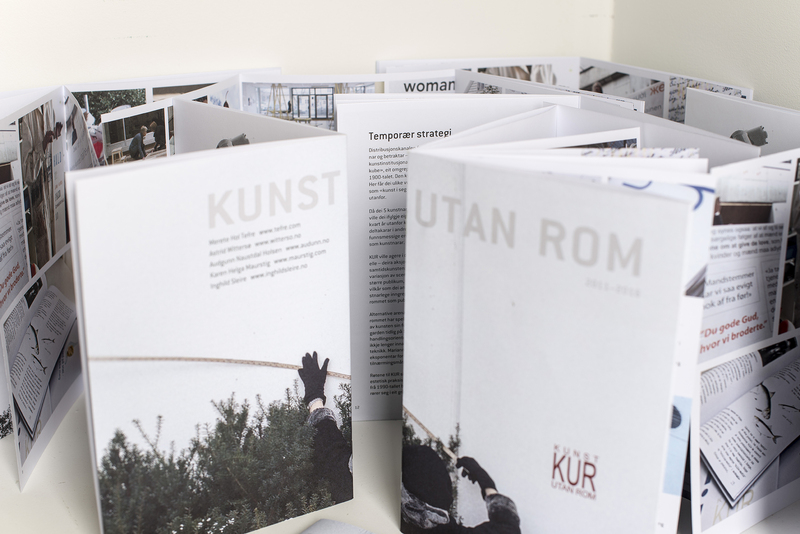 KUNST UTAN ROM (KUR) – Art without a room, was an independent group of artists, active from 2011 until 2016. The aim was to develop a non-bureaucratic and artist-run alternative to the professional art scene in Sogn og Fjordane. Through various projects, we wished to make artistic activity visible, and create an arena for experimentation and interaction. The starting point for the project KUR was the wish to find an arena for collaboration. We concentrated at first on finding a location where we could work, meet and invite the public to come and participate. After some time we realized this would tie up time and finances more than that we would achieve the flexibility we were looking for. Therefor in, 2012, KUR was founded. KUR aimed to produce 2-3 art projects each year. We could be the organizers, or participate in projects initiated by others. Our focus has been towards temporary art projects that would not permanently have an impact on the surroundings. We also aimed to visualize possibilities, to ask questions, and to present ourselves as artists. KUR aimed to use art to show social engagement and involvement in important issues in society. Every artist would contribute with his or hers specific qualifications and expertise. The fact that we geographically lived close to each other made it easy to meet and implement projects with short deadlines and at low costs. We were interested in collaboration with both private companies and public institutions. The participating artists are all members of NBK – Norwegian Visual Artists Association and/or NK, Norwegian Association for Arts and Crafts. The large soft moments in Finnskogen March 10 – March 12, 2017. Norwegian Textile Artists (NTK) is celebrating its 40th anniversary during the whole 2017 with several exhibitions and events around the country. 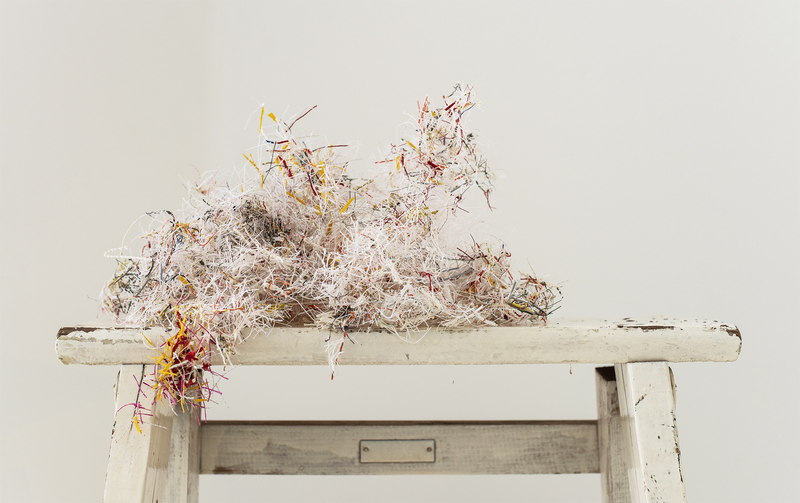 All members of the NTK are invited to submit images of both new and older work. The response was great and the jury selected 59 works of art by a total of 52 artists from the period 1983 to 2017. I participate with two textiles; one from 2017 (Rosa Variosa) and one from 1993 (Mine streaks). Curator: Marianne Tjønn, Solveig Aalberg and Anne Knutsen. Ane Vik Eines, Anna- Liisa Silentia, Anne Ingeborg Biringvad, Anne Kari AMSTEIN, Anne Knutsen, Anne Stabell, Anniken Amundsen, Aud Bækkelund, Audgunn Nausdal Holsen, Bente Knudsen Sanden, Berit Overgaard, Borgny Svalastog, Brita Been, Brynhild Slaatto, Danuta Haremska, Dorte HERUP, Eline Medbøe, Ellen Grieg, Ellen Lenvik, Gabriella Göransson, Gitte Magnus, Hanne Frey Husø, Ida Helland Hansen, Inga Blix, Inger Johanne Rasmussen, Ingrunn Myrland, Ingrid Aarset Ingunn Bakke, Ingunn Skogholt, Ingunn Vestby, Jorunn Steffensen, Karen Kviltu Lidal, Kari Dyrdal, Kari Steihaug, Kristin Lindberg, Kristin Sæterdal, Kristine Fornes, Marianne Magnus, Marianne Mannsåker, Marianne Tjønn, Marit Gulbrandsen, Nina Risåsen, Ragnhild Monsen, Randi Liliequist, Runa Boger, Siri Berqvam, Solveig Aalberg, Tone Hellerudveien, Tone Saastad, Tove Pedersen, Trine Mauritz, Turid Steinsland. This reconstructed pattern is constructed from two small pieces of fabric, found in a folk costume from Jølster, Norway. When you have only one little piece of a larger fabric you have to find how the whole pattern looks. This work did I a years ago (1997). The fabric is printed on cotton canvas. There is little information about the original is preserved in the collection of the Museum Sunnfjord, Norway. There is little info the original. Thanks to Costume Democracy Committee in Sunnfjord Ungdomslag; Aud Sunde (dead), Ann Lundekvam and Bodil Myklebust. A few years ago I reconstructed this national costume fabric for an old national costume from Jølster. When you try to reconstruct a pattern from a garment, it is not certain that you have the entire pattern. And maybe you do not find the report either. 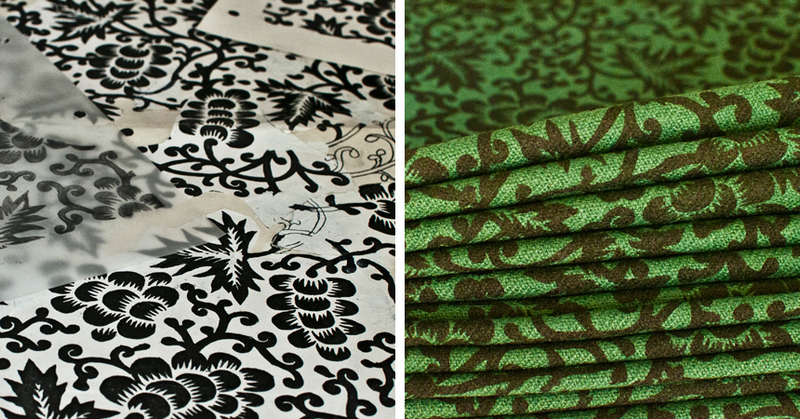 Then you have to imagine what is in between … These fabrics with black print on wool is found used in different parts of folk dresses. Thanks to Costume Democracy Committee in Sunnfjord Ungdomslag; Aud Sunde (dead), Ann Lundekvam and Bodil Myklebust. When I am working with an artwork the idea of ​​how to use the leftovers in the next comes, either as inspiration or concretely cleanup. This is one of my different sides of my work processes. I alternate between textile art, design and craft and give all the same status. I like to analyze situations and think through the relationship between technique, materials and situation.